Electrocompaniet launches EC Living wireless AV system | What Hi-Fi? Electrocompaniet has revealed details of its EC Living modular streaming system, which aims to "redefine how an audio system works". There are four products in total, three wireless speakers – two all-in-one models and an add-on speaker for creating stereo pairs – and a video streaming model. The Norwegian company is better known for its high-end electronics but it now looks to be branching out, following the likes of Bose, Denon and Sonos in delivering a wireless solution with the option to add multiple speakers, albeit without pushing multiroom functionality. The Model #1 is, as you might expect, the "base model". 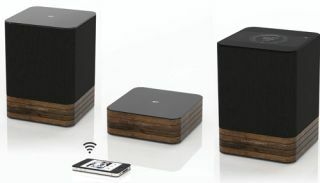 Effectively a wireless speaker, it will stream music from a UPnP server, streaming music services (relatively small Scandinavian provider, WIMP, is the one mentioned) or using AirPlay. It can be controlled by an Android or iOS app, or from a web browser. If you'd rather have a stereo speaker set-up, that's where the Electrocompaniet Model #2 comes in. It's an active loudspeaker, using Class-AB amplification, is available in a wide range of colours and pairs with either the Model #1 or Model #3. The Model #3 is billed as the most complete product, adding controls and a display on the top of the speaker, as well as the features of the Model #1. Last but not least is the Model #4 (pictured top, centre). Looking like a chunkier Apple TV, this model brings HD video to the party, using the same app and web interface as the speakers in order to get your video content on the big screen. As you'd expect, you can pair the Model #4 with the speakers for an EC Living audio/video system. You can build 2.1 systems and beyond, right up to an '8.4 cinema system' according to Electrocompaniet. Designed and assembled in Norway, the Electrocompaniet EC Living system is due out in August. We're awaiting further details on the specifications and prices.